OTTAWA — No. 7 seed Bellevue had a good game plan Friday night in a Division IV regional quarterfinal at Ottawa-Glandorf. It was executed perfectly for almost a half, but for the second half, the Titans caught up to their plans. Bellevue led 20-7 late in the first half Friday night on its way to an upset of No. 2 seed Ottawa-Glandorf, but a quick score from the Titans before the half changed the whole complexion of the game and Bellevue’s season in the end. 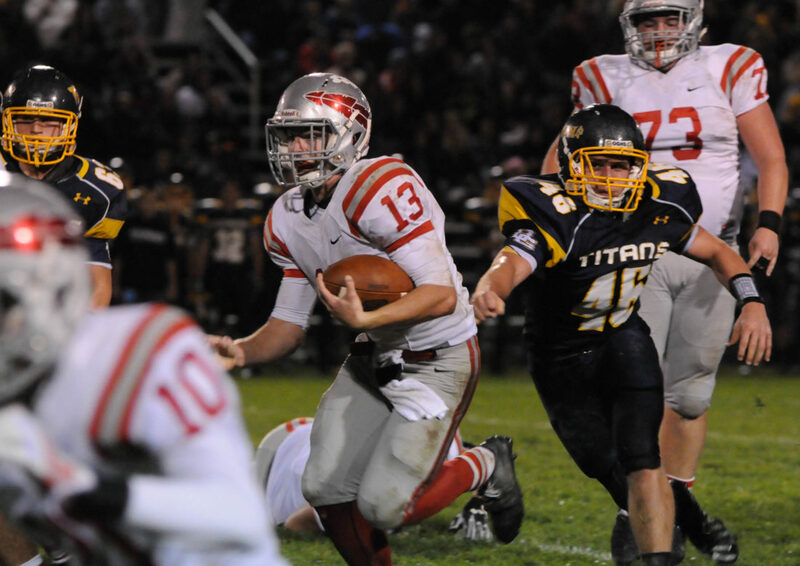 Despite leading 20-14 at halftime, the Redmen (7-4) couldn’t slow down the Titans’ (10-1) offense in the second half, being outscored 35-14 in a 49-34 defeat. “Thought we did a good job in the first half with keeping our offense on the field and keeping theirs off, which was probably our best defense in the first half,” Bellevue coach Ed Nasonti said. “They then got it rolling in the second half. I think they got it rolling right at the end of the first half and then it carried over into the second half. The Redmen did exactly what they wanted to, starting out with a Bryce Ray rushing score from a yard out to begin the game on the first drive, which was helped out by a 29-yard Alec Foos pass to Dakota McPeak on a fourth-and-6. The Redmen defense held Ottawa-Glandorf to a limited number of positive plays in the first few drives, but being backed up to their goal line late in the first quarter cost the Redmen. Foos punted to O-G’s Connor Niese, who made one guy miss and took back the punt for a 42-yard score. The momentum switched to Ottawa-Glandorf, but Foos and Bellevue responded. Foos ran in a 33-yard score up the middle and then he capped off a 16-play drive with a 3-yard plunge that ran off more than six minutes off the clock. But it was still too much time for the Titans. Quarterback Jay Kaufman, who threw for 205 yards and rushed for 138 more, completed four straight passes to get the Titans down to Bellevue’s 10 with under a minute left in the half. After two incompletions, Kaufman found Richie Knowlton on a 10-yard out route to cut Bellevue’s lead to 20-14 at the break. “It was just a tale of two halves and we didn’t get enough plays in that first half to show them what we could do, and that’s a testament to their defense,” O-G coach Ken Schriner said. “We didn’t execute. Then at halftime we calmed down and got back together. We didn’t change anything game plan-wise, we just came out and executed much better in that second half. After trading punts to begin the second half, O-G started to roll as Kaufman ran in a 5-yard touchdown on a QB draw, he hit Trent Basinger on a jailbreak screen for a 19-yard score and then he dove into the end zone for a 13-yard TD, giving the Titans a 35-20 advantage late in the third quarter. Ottawa-Glandorf extended its lead to 22 points with a Niese 8-yard score to begin the fourth. Bellevue did make things interesting with a 2-yard Foos rushing TD and a two-point conversion pass to Joe Vogel to cut the lead to 42-28 with 8:08 to play. It just needed one stop to get back in the contest. It just couldn’t get the Titans off the field when it had to. Daniel Beemer bulldozed his way in from a yard out for the Titans, before the last score of the game came off a Foos pass to Treston Francis for a 19-yard score. “They came out in the second half and started manning things up a bit and started bringing some pressure for a couple sacks,” Nasonti said. “It took us a little time to get adjusted to it and in the mean time we are getting sacked and having to punt and turning the ball over and then giving up scores, so that all contributed for them getting it going. Besides the punt return for a score, Niese totaled 106 yards of offense for the Titans, while Knowlton had five grabs for 83 yards. For Bellevue, Foos ran the ball 42 times for 183 yards and was 16 of 28 passing for 173 yards and threw a pair of picks. McPeak recorded seven catches for 96 yards.